I meant to write this back on 8/2, but time has certainly taken on a new meaning now that we have a new roommate. I have to commend dear Mrs. Gastro for shattering each and every pregnancy stereotype out there, but I would be a filthy liar if I didn't say I was a little disappointed at the lack of cravings. If nothing else, it would have given me carte blanche to eat Taco Bell completely guilt free at her whimsy. But craving or not, every once in a while hunger would give way to something exotic and/or greasy. This time around, it was soup dumplings, something I haven't had since moving from NYC, and something that I sometimes miss even more than my SLC-based parents. Baby Gastro's refusal to arrive on time left us with little do to but be angry about it. After the due date came and went, we almost felt like it wasn't going to happen, and my darling wife would be pregnant for the rest of her days (which would be kind of sweet because I'd have a permanent designated driver). This anger quickly became hunger, and before we knew it, we were avoiding eye contact with junkies and huffing gas fumes as we made our way into Dim Sum Garden, a well documented diamond in the rough and supposedly the only place in Philadelphia that serves up these gastronomic gobs of goodness. I always find myself at Chinese restaurants during the staff lunch break, and this time was no exception. If I was in the middle of eating a three foot pile of lo mein, I wouldn't want to be disturbed either, so I had no expectations for prompt service. Besides, Mrs. Gastro wasn't going into labor anytime soon. When the waitress finally ambled over, we managed to spoil our dinner with soup dumplings, scallion pancakes, and a deep fried pork chop nestled among noodles that were more fettucine than lo mein. The dumplings were perfection, dredging up memories of the first time I ate them, anticipating a burnt mouth but caring very little as I bit into one resting on a spoon used to catch the broth, which was so rich and full of fat that it would become chewable at lower temperatures (that's a good thing). 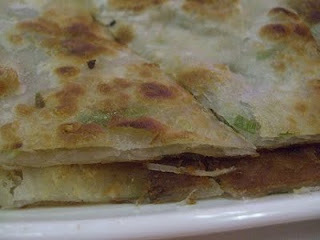 The scallion pancake was another success, a flaky crust surrounding a pastry dough interior, studded with green onions, and deceptively light. The deep fried pork chop was an afterthought, but by no means regretful. 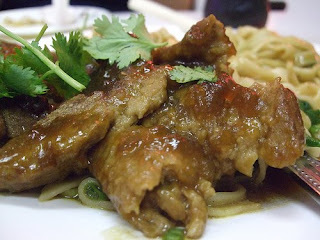 It was another rich dish, so meaty that if you told me the noodles were made of meat, I would have believed you. 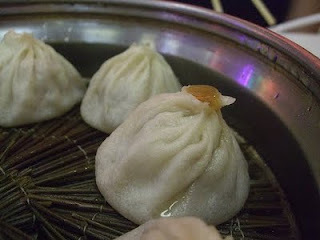 What's odd about the whole experience, apart from that whole dining under an elevated parking garage next to a makeshift bus depot, is that we still can't figure out how soup dumplings even came up. Regardless, we'd go back every day if we could. Some things are just that delicious. Buen provecho. Dim Sum Garden is located at 59 N 11th Street in Philadelphia, where the convention center meets Chinatown. It's not the best location, but your mom told you not to judge a book by its cover, and I suggest you do what your mom tells you. We got three menu items and two Cokes for $25 including tip. Cash or credit card, no booze. 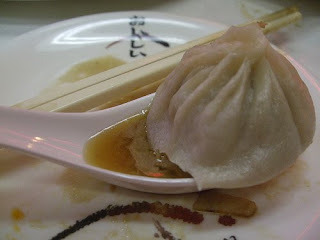 Fidel-You can also get soup dumplings at Sakura.